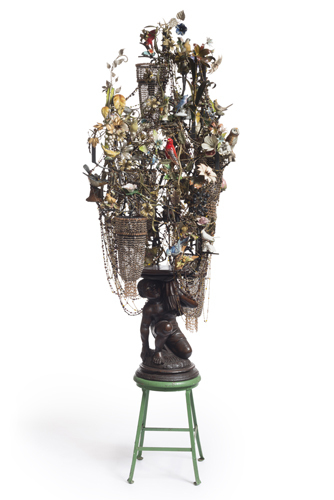 Nick Cave is an African American sculptor, costume maker, and performance artist. He uses objects he finds at thrift stores, flea markets, garage sales, and the like to create elaborate and decorative works of art that are sometimes beautiful and sometimes troubling. End Upheld has both of these qualities. The sculpture includes a racist image of a male figure of African descent. The object may have once served as a pedestal or a stool. Now it is elevated, sitting atop a stool of its own. Raised to new heights, the figure supports a striking and complex latticework of birds, beads, flowers, stylized lamps, and other ornaments. The title of the sculpture, End Upheld, is a play on words. Just as the figure may have once been a stool for someone to sit on, in this new context it is supporting a world of beauty and light. Through the process of making art, Cave has transformed an object representing a painful, oppressive past into a source of hope and transcendence.